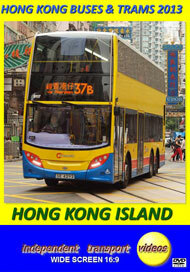 There is always something new to see in the transport scene on Hong Kong Island! This is evident by the return of the independent transport videos cameras for yet another visit at the end of 2013. There are the new 12 metre ADL Enviro 500 New Generation (NG) double deckers now in service with Citybus and K.M.B. Citybus have also introduced an 11 metre version as well as new Enviro 500NG’s for the Cityflyer fleet. Further rebodied trams are in evidence, as well as an abundance of new colourful overall advert liveries. Old favourites are still giving yeoman service. There are still a handful of Citybus Leyland Olympians operating on the non franchised services, as well as the final batch of Volvo Olympians operated by New World First Bus which will probably be retired in 2014. The filming covers the Island from Central and then heads east along the northern coast to Siu Sai Wan. We then head south to Stanley and Aberdeen, and then return to Central for a good action finale along the western end of Des Voeux Road. There is plenty to see along the way! Our filming starts at the Central bus station at the Star Ferry, then moves to the other Central bus station at Exchange Square. Connaught and Des Voeux Road is our next location, where there is plenty of action with buses from the three major bus companies as well as the trams. From here we head to Wan Chai and then onto Moreton Terrace Bus Terminus at Causeway Bay. Shau Kei Wan is always a good place to film with the bus station and the main road offering good vantage points. Siu Sai Wan is next before we head south to visit Stanley. We reach Stanley on board a Citybus Envio 400, 7018 (RB 3619) on route 6X with the driver’s eye view! With filming complete at Stanley we head to Aberdeen where there are street scenes, bus station and bus depot scenes and action on the Ap Lei Chau Bridge. We return to Central on board a Citybus Volvo Olympian, 579 (HD 7684) on route 70, also with the driver’s eye view! Our filming on Hong Kong Island concludes along the western end of Des Voeux Road. We hope you have enjoyed your tour. Kowloon and the New Territories are covered in the preceding two programmes.